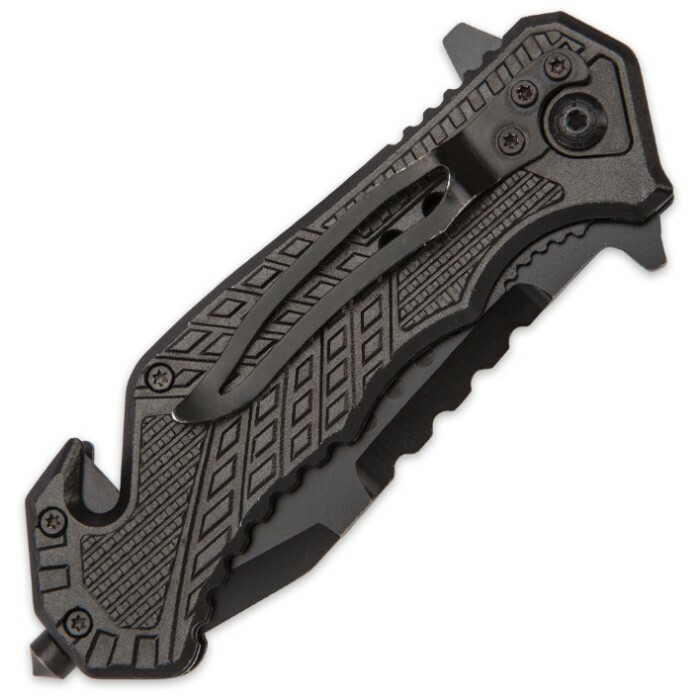 Black Legion Firefighter Rescue Pocket Knife with Seatbelt Cutter, Glass Breaker | BUDK.com - Knives & Swords At The Lowest Prices! 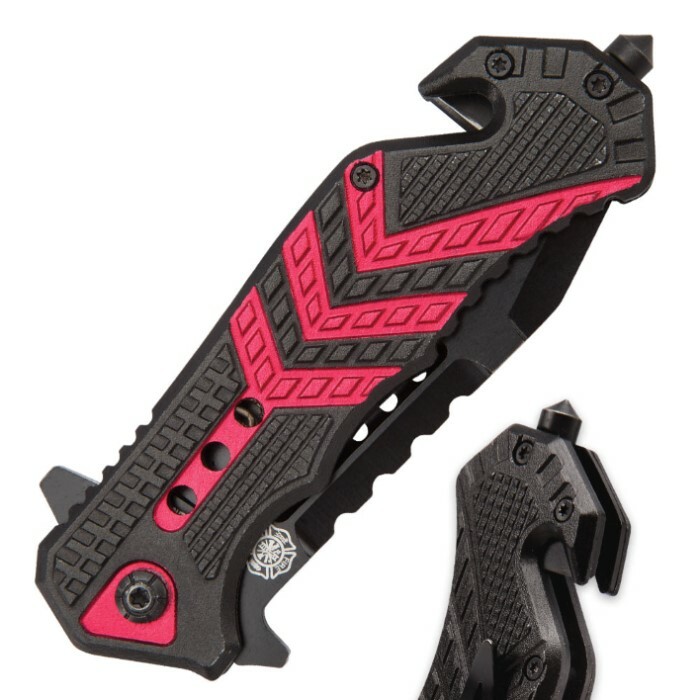 Like America's brave firefighters, you too can stay poised and ready to take on any crisis with the Firefighter Rescue Pocket Knife from Black Legion. Boasting a versatile, partially serrated 3 1/2" stainless steel drop point blade, this tough folder can tackle practically any everyday cutting job and then some. 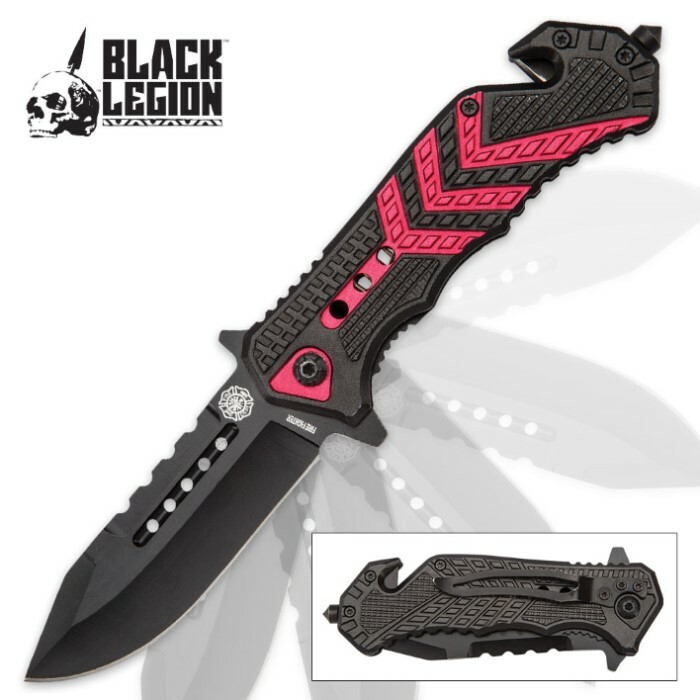 The blade is stylishly enhanced with a nonreflective black coating, a row of chic through-holes and complementary firefighter-themed laser etchings. Like a firetruck speeding toward the scene of a fire, the blade deploys with impressive speed. With just a flick of the wrist and a gentle tug of the handy blade spur, one-handed opening is easy, fast and smooth. The sleek red and black handle is extraordinarily durable and delicately textured for a no-slip grip and improved control. At 4 1/2" closed, the Firefighter folder fits comfortably in jeans pockets, especially with the included pocket clip. Faithful to its moniker, this knife is a perfect "rescue" knife that could even save your life in an emergency! The integrated seatbelt cutter and glass breaker allow you to escape or help others escape entrapment in a vehicle or building during a fire, wreck or other calamity. Black Legion's Firefighter Rescue Pocket Knife makes a heartfelt, memorable gift for a firefighter in your life. It’s also a great way for civilians to show their solidarity and support for the brave men and women who risk their lives to keep the public safe. Chic design pays homage to heroic firefighters 3 1/2" partially serrated stainless steel blade One-handed opening via handy blade spur Seatbelt cutter, glass breaker, pocket clip Closed length: 4 1/2"